This Year's Theme: "Who Wins Most by Sudden Death?" Last year, the Law Offices of Kenneth M. Phillips, the nation’s leading dog bite attorney and author of DogBiteLaw.com, released a video on social media. "Super Bowl Commercial That Says: 'Do Not Adopt a Pit Bull' - Share this to help show that pit bulls are too dangerous to adopt," states the January 18, 2018 Tweet. The video received over 8 million views on Twitter and over 100,000 shares on Facebook. The video caused such a stir on the Internet that Snopes investigated. In 2018, rescued and rehomed dogs killed 19% (7) of dog bite fatality victims. 86% (6) of these fatal attacks were carried out by pit bulls. This year's video out does last year. With a theme of "Who Wins Most by Sudden Death," Phillips reminds viewers that pit bulls cause real "sudden death" every two weeks in our country -- at least 24 deaths in 2018. "Most victims were family members -- and babies," states the video. Given that this is true, why would any family adopt a pit bull when the majority of these dogs also have a totally unknown background? The final message of the video is, "Do not adopt a pit bull." The 2018 video is 30-seconds long and flashes a score of 29-0 across the screen with screaming football fans in the background. Then the type begins: "They killed the most kids. They killed the most family members. One breed killed 75% of the people who were mauled to death in 2017." 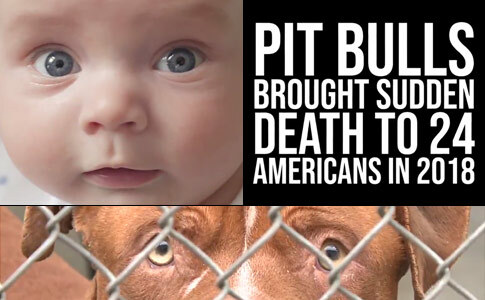 At half way through, the video reveals, "Pit bulls killed 29 Americans in 2017." Then states, "That's nothing to cheer about." The final message of the 2018 video is, "Do not adopt a pit bull." In 2017, rescued and rehomed dogs killed 15% (6) of dog bite fatality victims. 83% (5) of these fatal attacks were carried out by pit bulls. After last year's Super Bowl, Phillips spoke to City Watch ('Do Not Adopt a Pit Bull' Super Bowl Commercial Pays Off!). "My video was one concerned citizen's attempt to teach and protect the public. The video was seen over 8 million times on social media and was even broadcast on TV news in some areas. If it helps to prevent just one death, one mutilation, it will have served its purpose," Phillips said. With that many views, his video most certainly did accomplished this. We hope that everyone stays safe over this year's Super Bowl weekend. We also remind readers what the good doctors have to say about the pit bull breed. "Strong consideration to avoidance of any interaction between pit bull breeds and young children, particularly infants," (Golinko et al., 2016) and "Attacks by pit bulls are associated with higher morbidity rates, higher hospital charges, and a higher risk of death than are attacks by other breeds of dogs." (Bini et al., 2012). I would love to see this ad during to game. It has the power to change the statistics. Love this! Hopefully a few pit whack jobs will choke on their appetizers when they see it. Love this too. But you know that they will get so offended that their “pibbles” are so misunderstood (sarcasm). I’m all for showing the truth about what these maulers can do and think it is great that it will be widely shown. I hope they get so offended, they can’t finished their nachos because they are so upset about the truth .In my field, my co-workers fawn over pits who come in and gush at how handsome they are to their owners. GAG. The owners eat it up. Double gag.To me, these are the ugliest dogs.